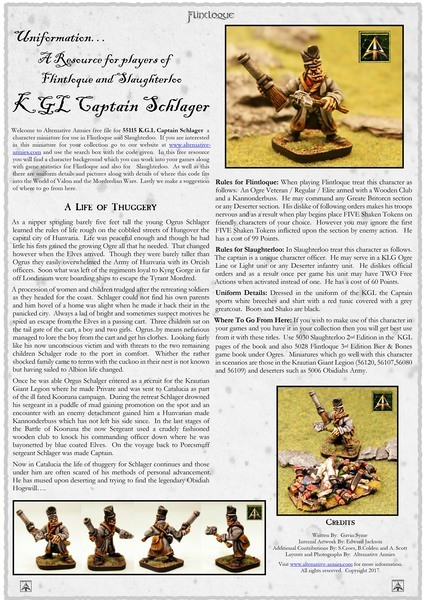 A brand new miniature for use in Flintloque and Slaughterloo now released at Alternative Armies. Introducing 56115 Captain Schlager of the Krautian Giant Legion (KGL) a part of the Army of Greate Britorcn. 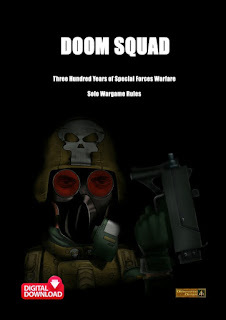 Exiled from their homeland of Hunvaria after it was annexed by the Emperor Mordred the KGL are veteran soldiers and some of the finest which can be called upon by Kyng Gorge. Well most of them. Captain Schlager is something of a ruffian and not keen on following orders. 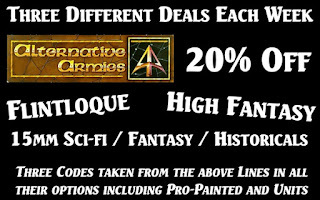 Go HERE for the miniature or click HERE for a free Uniformation article download with rules and more from our website. Thanks! This pack contains one 28mm scale multiple part resin miniature depicting an officer in the ranks of the Krautian Giant Legion (KGL). 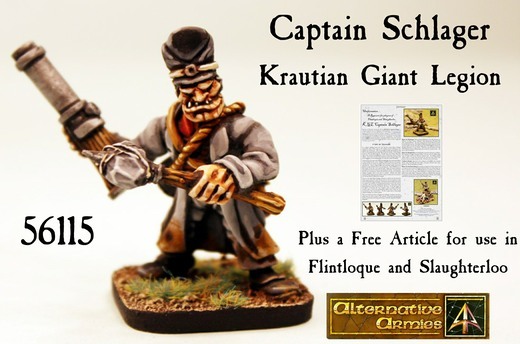 Captain Schlager comes as a body, a head, a left arm and a right arm which is approx 40mm tall when assembled. He is in the uniform of the KGL and wears a great coat; armed with a stone club and a Kannonderbuss. There is a degree of pose in the neck and arms. 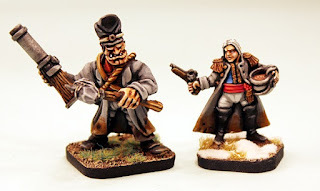 This miniature can be used as part of the KGL or as a Deserter in Obidiahs Army or as a freebooter in Catalucia or Central Urop. 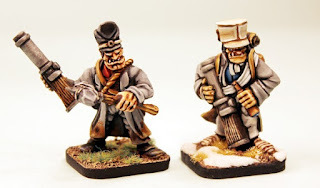 Ogrus Schlager is a bully and a thief who has risen through to the level of Captain by thuggery and guile plus a couple of 'accidents' in the field happening to those who got in his way. 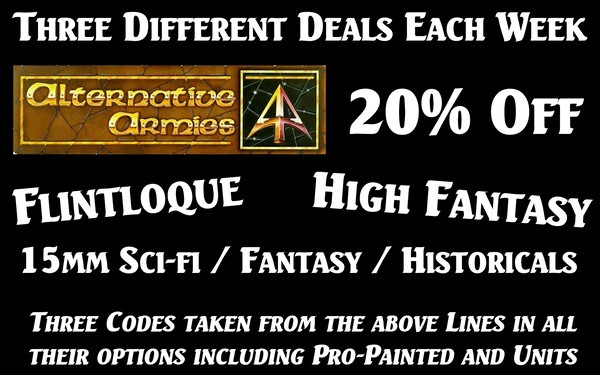 You can also purchase this miniature pro-painted and based for play here in Scotland for immediate use just select that option on the page. Supplied with a 30mm square cartouche style resin base. Assembly is require of a low complexity. 5.00GBP per pack. Go HERE. Above are scale shots with Elf and Ogre from 5024 Escape the Dark Czar beginners set for Flintloque. 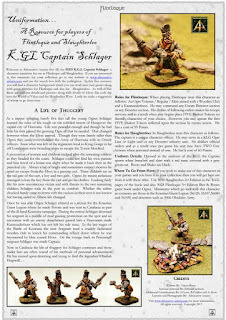 Download a free Uniformation article which contains fiction, background and rules for Flintloque and Slaughterloo plus images for this miniature. It is hosted on our website and you can get it by clicking HERE. We have a vast amount of free files for you which you can get by going to our FREE DOWNLOADS page. 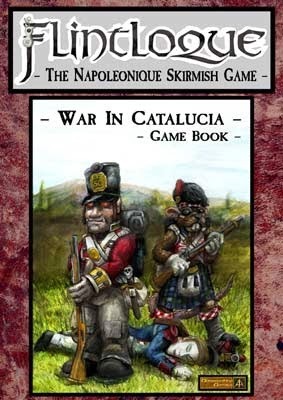 You can learn all about Catalucia and the Krautian Giant Legion with the 5025 War in Catalucia for Flintloque, 5028 Bier & Bones plus 5030 Slaughterloo titles. Get playing in the hot dust of the land of the Dark Elves or in Central Urop. Go HERE.